It's hard to write about a month like this last one. It doesn't feel like we've made much progress. But that's because we're back in the reward-less deconstruction phase. Everything is connected to everything else, so you can't just do one project start to finish and see the progress. It's all prep work. Dirty dirty prep work. 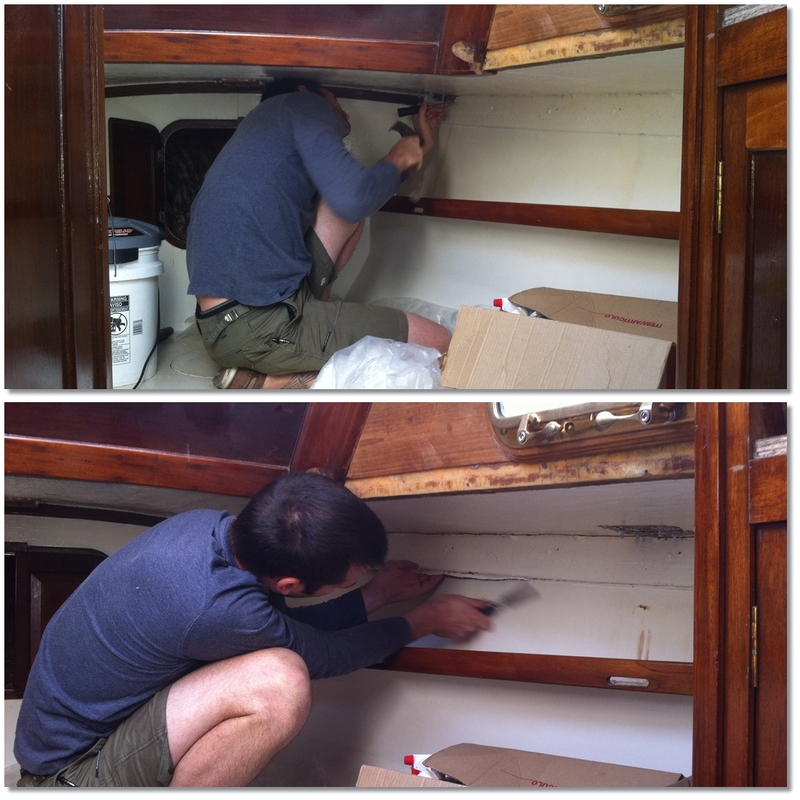 For instance, to install the toe rails the deck/hull joint needed to be cleaned and prepped on the inside. 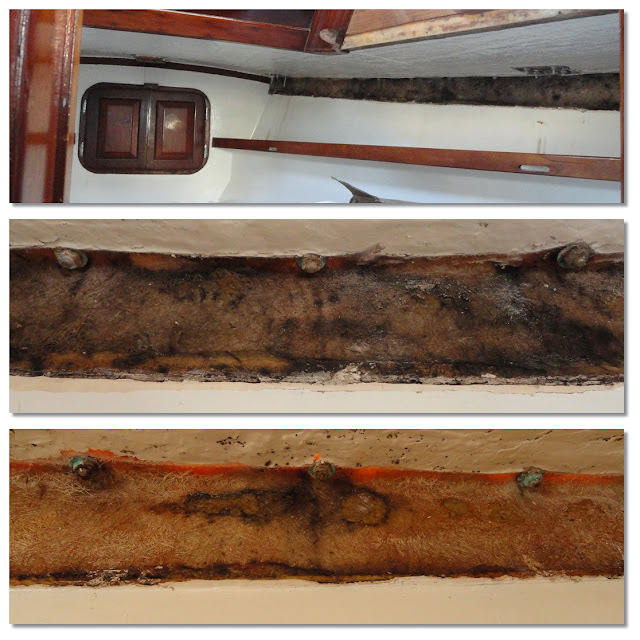 That joint is often behind cabinetry, in inaccessible moldy corners, or in the case of the V-berth, behind 2x4s. 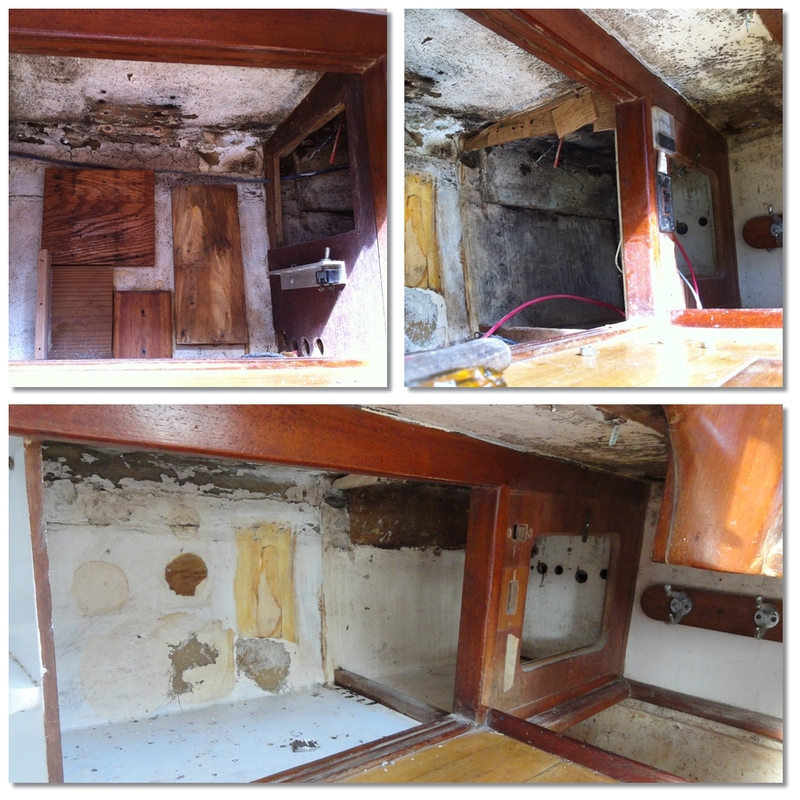 So prepping this area lead to cleaning the cabinets, stripping the remainder of the wiring, cutting out the chain plate fins, and lots of scrubbing, sanding and scraping. Here's the worst cabinet of them all. You can't reach the back without laying on your back and squeezing your head and shoulders inside and working a couple inches above your face. The moldy paint chips rain down. We removed the vent on the delaminating wall. It's unnecessary. And we need to fix the wall. AJ cut out the old chain plate fins. There were 6. When the cutting began the cabin filled with billowing sparkling glittering dust. But unfortunately repeating "I do not believe in fairies" 3 times did not make it go away. The new chain plates will be external. 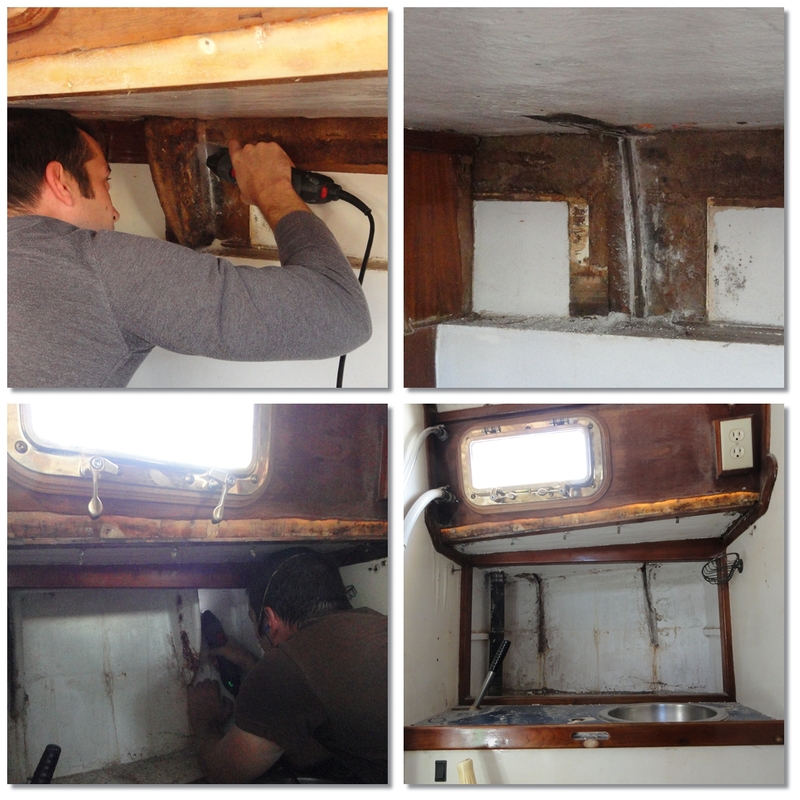 We removed the port side cabinets to ease access to the deck/hull joint for cleaning and toe rail installation. We were hesitant at first, but upon closer inspection found they were one solid piece held in place only by a lip rail on the bottom. So they came out easily without having to come apart. We replaced the delaminated plywood seat panels with PVC. 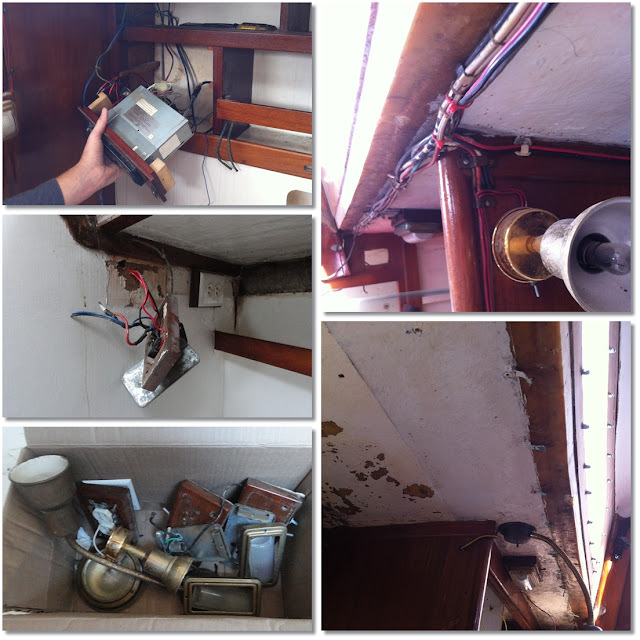 There was still wiring in the way, running all over the place, held up with corroded metal wire clips. So many wire clips... We went ahead and pulled all the light fixtures. We will be using led strip lighting, not these 1960's power suckers. And I think it might be time to update the cassette tape player. We get to wire the boat from scratch. 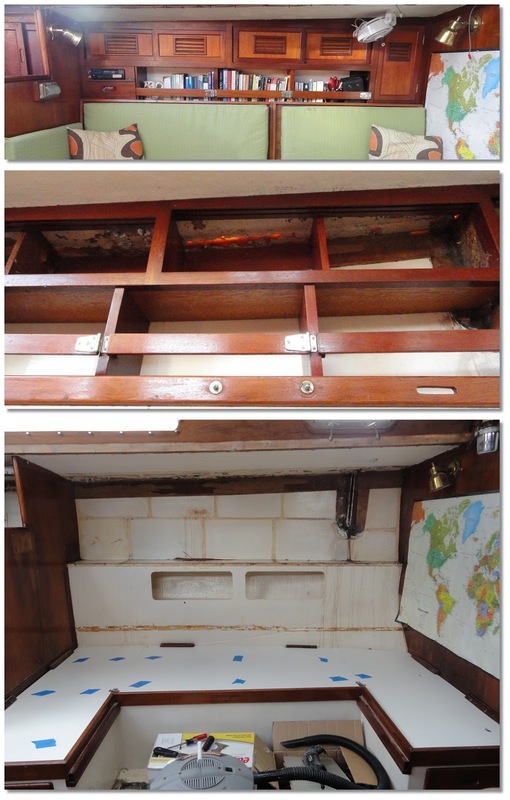 In the V berth there was a 2x4 along the deck/hull seam to hide the toe rail bolts. The old bolts were cut off at the deck, and knocked through to the inside everywhere except for in the V berth where they remained embedded. The 2x4 was glued on and came off with a chisel. It's not hard to tell which bolts leaked. We pulled the old bolts out and filled the holes with thickened epoxy. After scrubbing the black portions of the fiberglass until the water ran... less black. And we finally installed the gates to finished the stanchion job! The gates needed a pad for the second leg. AJ made starboard pads with the proper angle to sit flat on the deck. We are ready to move to real projects and fixing things! 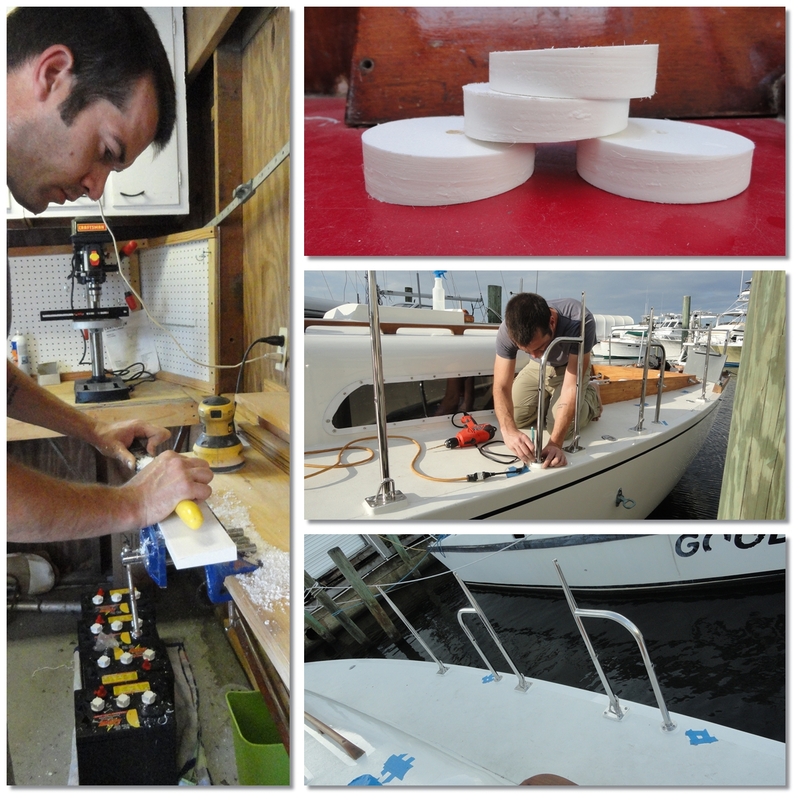 We are currently working on the bulk heads and mast support. 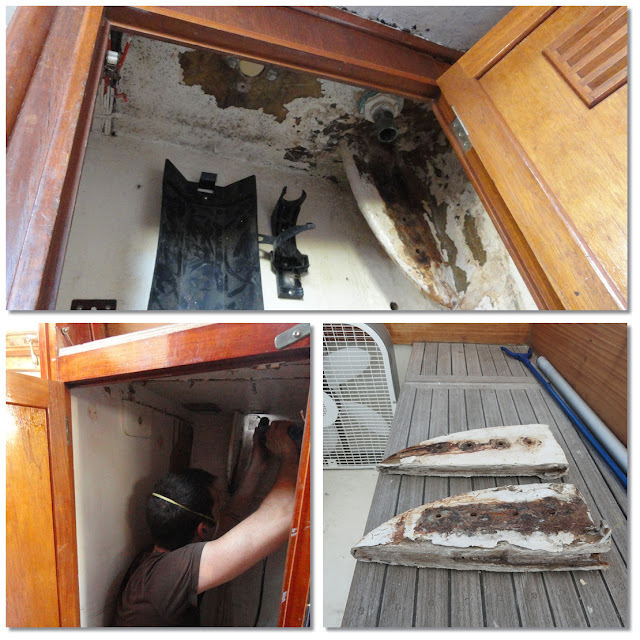 And the cabin is almost clean enough for sanding and painting. The horror, the horror of it all! You guys are brave! Following David's comment...... brave is putting it lightly. You guys deserve a statue or something, in the central square, in front of city hall of the town of all us "boat slaves"!! Population: plenty of us! On the fun note...I kept my old light fixtures, ripped out the in-yards, and spiraled some led tape in them. Came out so so. 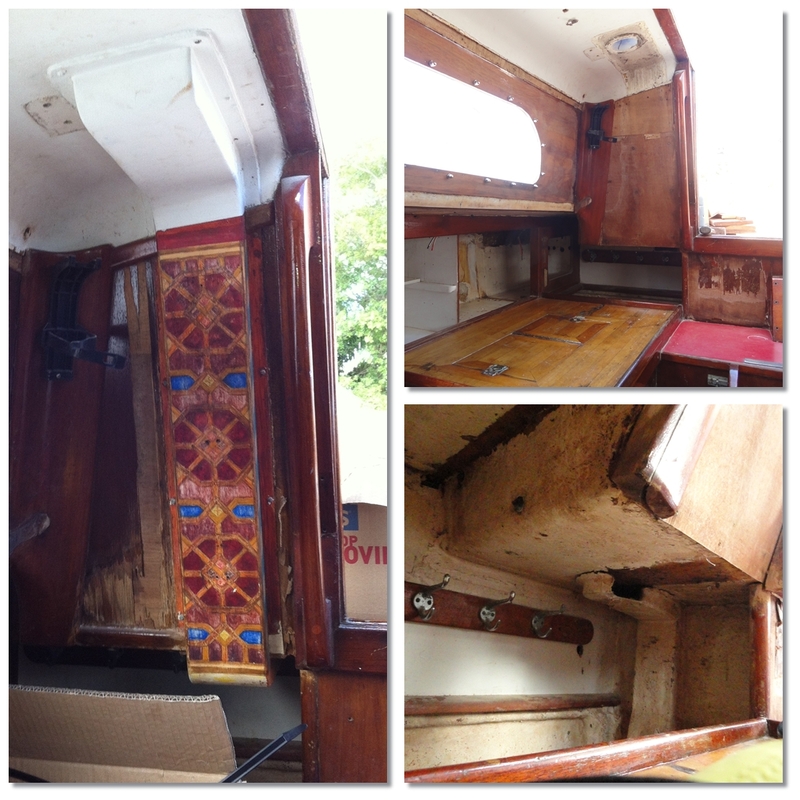 Just an idea to keep some original character to to old boat you've totally rebuilt!